Grewal-s Harjeet Singh and Sara Hakeem, Advocate Varinder Singh – Core team member of Anad Foundation, American India Foundation scholar Manleen Kaur Sandhu were in conversation with Bhai Sahib Bhai Balbir Singh ‘Shromani Ragi’ at Anad Conservatory, Sultanpur Lodhi Fort, Kapurthala. 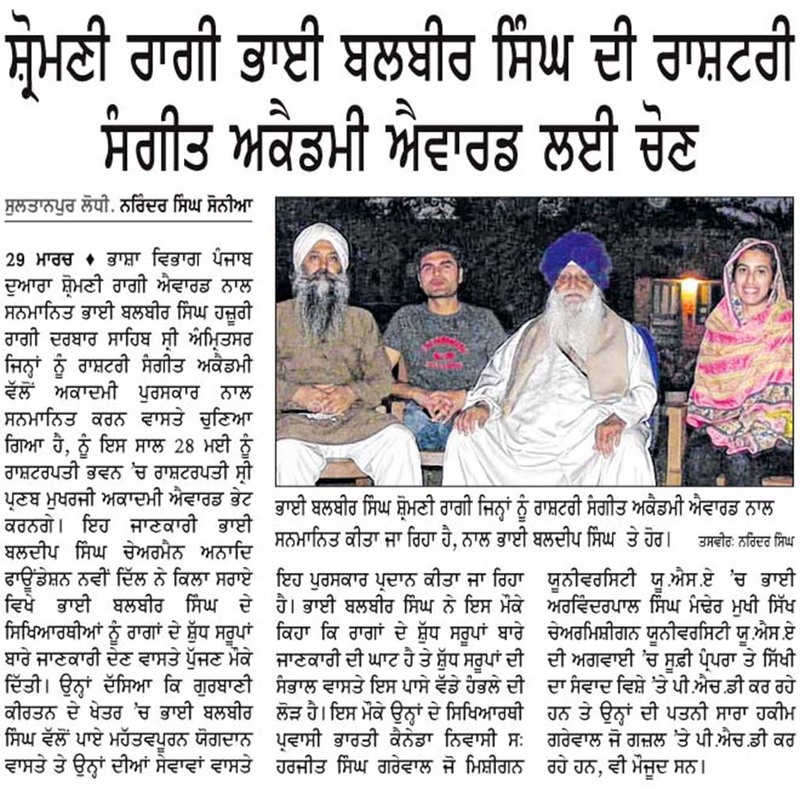 A report carried in Punjabi vernacular Daily Ajit by Narinder Sonia. The evening started with us being treated to a turban-tying demonstration by Bhai Sahib – the blue that you see him adorning. Then there were discussions on Sufi-Sikh discourse and about Ghazals, especially of Bhai Nand Lal. Bhai Sahib also sang a few Punjabi folk songs taking us all ‘back to the 40’s and 50’s’. He also shared memories of pre-partition era music scene with us as well as recounting some horrific scenes he witnessed during partition. He became pretty nostalgic reminiscing about the days spent in august company of the legendary Bhai Sahib Bhai Jwala Singh Ragi of Thatha Tibba in the late 40’s and early 50’s. Some serious debate and discussion about raga forms and the concept of ghar in Gurbani, between Bhai Balbir Singh Ragi and me, followed. With Bhai Sahib in good mood, expect the ambit stretch from the downright serious to the utterly hilarious – awe-filled, awe-inspiring, at times seeped in deadly sarcasm..! There is a sikh ragi by the name of Trilochan Singh, staying in delhi, india, who is a good friend of bhai balbir singh ji and who had also taught him a couple of ragas. You can ask bhai balbir singh ji about him and he will praise him a lot. The thing is that he has gone through very bad phases in his life, literally hell one can say. It would be a very good humanitarian service to contact him and utilize his talent as soon as possible as he is financially also in a very bad shape. But most of all he is a genuine person which is hard to find nowadays. Do you have Trilochan Singhs contact number Tejbir singh? Is there any way you can get it? Bhai Baldeep Singh’s interaction with legendry Sikh relious musician Bhai Balbir Singh ji needs to be conserved for posterity. We wish both long and accomplished lives.